I absolutely love giving and receiving homemade gifts. I find it’s so much more personal and I always really appreciate the thought and effort that has gone into it. I’m a really keen baker and therefore love making baked goods to give to others. Today I’m sharing my lemon drizzle loaf cake recipe which would make a lovely gift for Mothers Day. I have made this lemon drizzle cake countless times before and it never lasts long because it’s seriously tasty. I always think that a lemon drizzle is very appropriate for Spring and it would be the perfect addition to a Mothers Day afternoon tea spread. If you really want to impress then you can top the loaf with lashings of cream cheese frosting, lots of fresh blueberries and a dusting of icing sugar. This recipe works just as well when doubled and baked in a round bundt tin if you have more mouths to feed or alternatively you can bake lots of mini loafs using cases like these which I have done previously and they were a big hit especially with the little ones! Beat together the butter and sugar until pale and creamy. I use my Kenwood K mixer for this but can be done with a hand mixer or even just by hand. Add in the 4 eggs one at a time, slowly mixing through. Sift in the flour then add the lemon zest and juice and mix until well combined. Either grease and line a loaf tin (8 x 21cm) or us a loaf tin liner. Spoon the mixture into the prepared tin and level the top with a spoon. Bake for 45-50 minutes until a thin skewer inserted into the centre of the cake comes out clean. Set the cake aside to cool in the tin. Mix together the lemon juice with the 85g of caster sugar to make the drizzle topping. Prick the warm cake all over with a skewer or fork, then pour over the drizzle – the juice will sink in and the sugar will form a lovely, crisp topping. Leave in the tin until completely cool, then remove and enjoy served in thick slices with a dollop of cream or natural yoghurt and some fresh berries. *NOTE* – The loaf will keep in an airtight container for 3-4 days (I doubt it will still be around then 😉 ), or you can freeze it for up to 1 month. This recipe is my suggestion as part of the Cotton Traders Mother’s Day Inspiration Guide. You can see some other ideas here. Lemon is my favourite flavour ever! I even prefer it to chocolate. This sounds really delicious! 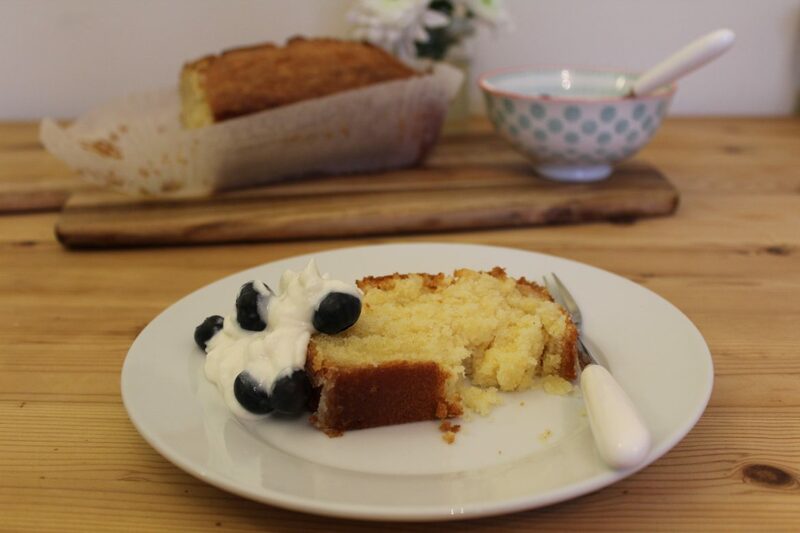 lemon drizzle is one of my favourites – this looks lush! don’t know if my previous comment went through?! this looks lush though! That loaf cake looks delicious but I am in love with your dishes and bits. So beautiful!!! I love lemon drizzle cake and always make it as it’s a favourite of my kids too. This one sounds delightful!